Our efforts to reach others with the Word of God through the internet have been rewarded with a very fruitful relationship with fellow Christians on the other side of the world. In 2006, we were contacted by a young pastor in the West African nation of Cameroon. Pastor Teh Francis is a graduate of the ACHA Baptist College, and he pastors a church in the town of Jinkfuin. 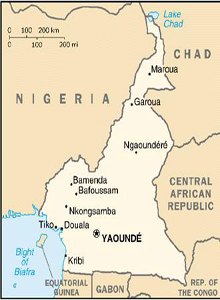 There has been much evangelism in regions of western Africa like Cameroon, which has led many people to Jesus Christ. And many new converts has led to a great need for prepared pastors to teach and shepherd them. For many congregations, however, there is no full-time pastor available, and many of the pastors have not been able to obtain a thorough instruction and knowledge of the Scriptures. These circumstances have enabled us at GCF to be of assistance to our brethren in Cameroon who have a serious desire to know the Scriptures and serve the Lord. Pastor Frances has maintained a frequent and ongoing correspondence with Pastor Ricci and the elders, and we have been able to provide him with many resources, including books, study materials, and most importantly Bibles. Pastor Frances has been a faithful student and teacher of the Word, and it has been a great privilege for us to work with him as fellow-laborers in the Gospel of Jesus Christ. 1 Corinthians 3:9 For we are laborers together with God: ye are God’s husbandry, ye are God’s building. 1 Corinthians 3:10 According to the grace of God which is given unto me, as a wise masterbuilder, I have laid the foundation, and another buildeth thereon. But let every man take heed how he buildeth thereupon. The website for Pastor Frances’ ministry is www.gmmafrica.org.